Over the course of the project, we organized a series of Method Labs, which serve as intensive workshops to develop our methodical research apparatus regarding transcultural educational practices. 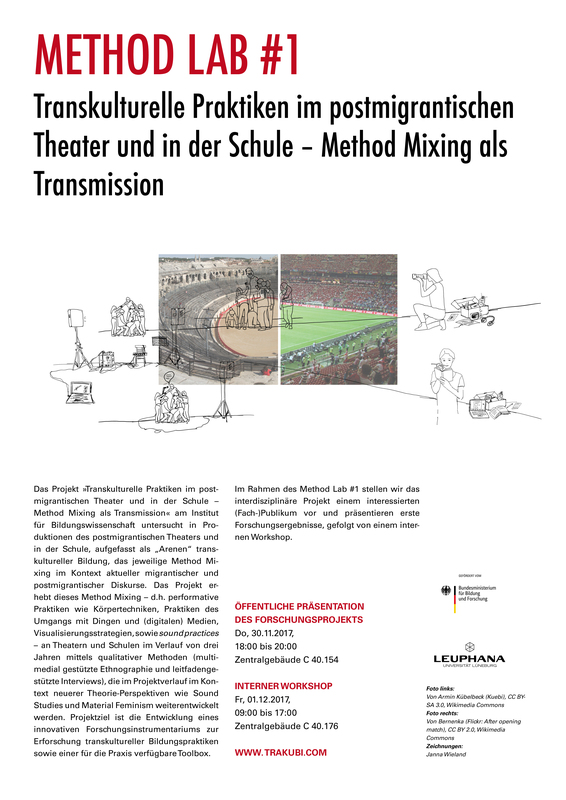 The focus of the first Method Lab is “Method Mixing as Transmission: Methods of Practice in post-migrant contact zones”. On Thursday, there will be a public presentation of the project, during which we will introduce the interdisciplinary project to an interested (specialist) audience and present first research results. We invite renowned researchers of theatre, sound, educational and cultural studies to our internal workshop on Friday, in order to discuss our (field) research results and the during the project developed innovative methods and methodologies, as well as in order to reflect on those and further develop them.